1976-05-06. Good. Ships with Tracking Number! INTERNATIONAL WORLDWIDE Shipping available. May not contain Access Codes or Supplements. May be ex-library. Shipping & Handling by region. Buy with confidence, excellent customer service! David McKay Company, 1976-01-01. Hardcover. Used:Good. David McKay Company. Hardcover. 0679506225 New Condition. . New. 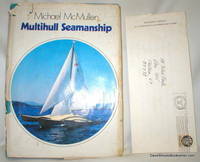 Hampshire UK: Nautical Publishing Company, 1976. 200 pages. 7 1/2 in x 10 in. Management at sea of catamarans and trimarans. Also includes cruising and racing tactics, design and construction. Nice book with 104 illustrations and some graphs. Pages v/g condition. Blue laminated boards with gilt title on spine. White dust jacket illustrated with color plate on upper cover. Edges show light wear. VG+/VG+. 1st Edition. Hard Cover. David McKay Company. Hardcover. 0679506225 Like New Condition. . Fine. New York: David McKay Company, Inc,, 1976 Blue cloth on boards. DJ nearly complete, but badly torn and heavily taped. Letter to John Earle, of Chelsea, VT., from Richard C. Newick (1926-2013), a builder of multihull boats, compares the VALS and NATIVE designs (laid in). Newick reports he has just started sketching a 40-42 foot boat of the NATIVE design for an Italian client, with an extra 4 feet added just abaft the main cabin. Newick is referred to twice in Acknowledgements and 3 times in the Index. This book is an obvious effort to report accurately on current construction of multihills. There are 104 photographs and drawings, with 18 pp. of Graphs of Round Britain and OSTAR races. 200 pp. . First American Edition Stated. Hard Cover. Very Good/Fair. Illus. by Andrew Spedding and Paul Brookes, et al. 4to - over 9¾" - 12" tall. New York, NY: David McKay Company, Inc.. G/G. (1976). First American Edition. Cloth w/DJ. Sm 4to., 200 pp., DJ rubbed, edges frayed & torn, cover edges rubbed & faded . David McKay Company, 1976 HARDBACK BOOK IN VERY GOOD-PLUS CONDITION,DUST JACKET IS GOOD TO VERY GOOD,FOXING ON TOP PAGE EDGES. 1st Edition. Hardcover. Very Good/Good. Nautical Pub. Co, 1976. Hardcover. Good. Nautical Pub. Co, 1976. Hardcover. Good. Disclaimer:A copy that has been read, but remains in clean condition. All pages are intact, and the cover is intact. The spine may show signs of wear. Pages can include limited notes and highlighting, and the copy can include previous owner inscriptions. The dust jacket is missing. At ThriftBooks, our motto is: Read More, Spend Less. David McKay Company. Used - Good. Shows some signs of wear, and may have some markings on the inside. David McKay Company. Used - Good. Ships from Reno, NV. Shows some signs of wear, and may have some markings on the inside. 100% Money Back Guarantee. Shipped to over one million happy customers. Your purchase benefits world literacy! David McKay Company, 1976. Hardcover. Good. McKay Company, Incorporated, David, 1976. Hardcover. Very Good. Disclaimer:A copy that has been read, but remains in excellent condition. Pages are intact and are not marred by notes or highlighting, but may contain a neat previous owner name. The spine remains undamaged. The dust jacket is missing. At ThriftBooks, our motto is: Read More, Spend Less. David McKay Company. Hardcover. 0679506225 Item in acceptable condition! Textbooks may not include supplemental items i.e. CDs, access codes etc... . Fair. David McKay Company. Hardcover. GOOD. Spine creases, wear to binding and pages from reading. May contain limited notes, underlining or highlighting that does affect the text. Possible ex library copy, thatâll have the markings and stickers associated from the library. Accessories such as CD, codes, toys, may not be included.